Dear friends, family and amazing supporters, we hope you have had an absolutely joyous holiday season and we wish you all a very happy new year! We are so excited for what 2018 brings, with our determination to save Africa's big cats stronger than ever. The fire that burns in us to achieve this goal was fueled back in 2012, but continues to burn bigger every time a tragedy occurs, like the one on 19th December 2017 where a tiny lion cub was the victim of a horrific human-lion conflict incident in the Masai Mara, Kenya. Lions are seen as a threat by the Masai people who's livestock are their livelihood. 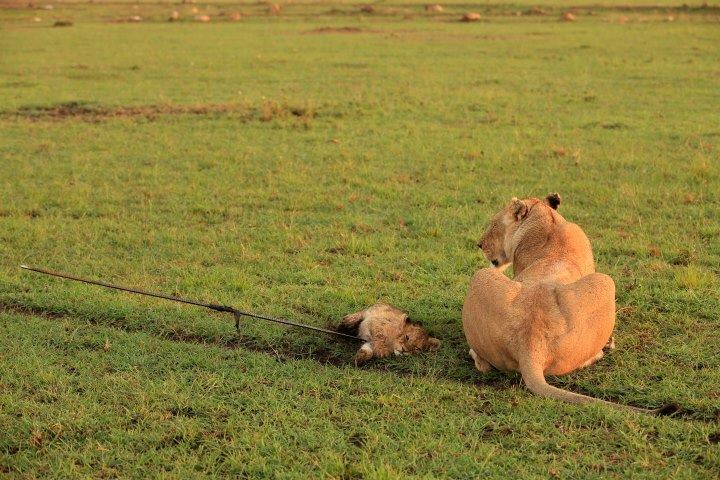 With the amount of land running out, Masai herders often illegally graze their livestock in National Parks and often attack lions just for existing, as a preventative, and this is what happened in the case of this poor little cub. He stayed alive like this for the entire day before vets finally arrived and treated him. Sadly, he went missing overnight and has not been seen again. His injuries were most likely too severe and he died overnight or was taken by another predatory animal. Our lion project aims to stop preventative and retaliatory killings by installing LED (Lion Entry Deterrent) Systems on the livestock bomas (enclosures) of Masai farmers in and around remote areas in Kenya, mostly the Masai Mara but also in the Nairobi National Park and sometimes in bordering Tanzania. Click here for more information and how you can help us do that.